The pioneering work of the Nobel Prize winning LMB scientists, George Kohler and Cesar Milstein, involved the discovery of a method to produce monoclonal antibodies from mice. This work has led to monoclonal antibodies being used as transformative treatments in diseases ranging from cancer to psoriasis. Without the use of mice this work would not have been possible. LMB scientists are using mice and rats in their research to understand biological processes at the molecular level with the aim of tackling major problems in human health. Five million people suffer from asthma in the UK and deaths from asthma occur daily. LMB scientists are investigating asthma to identify novel targets for the development of new therapies. With an increasingly aging population, the risk of developing neurodegenerative disorders such as Alzheimer’s, Parkinson’s or Huntingdon’s diseases is rising. 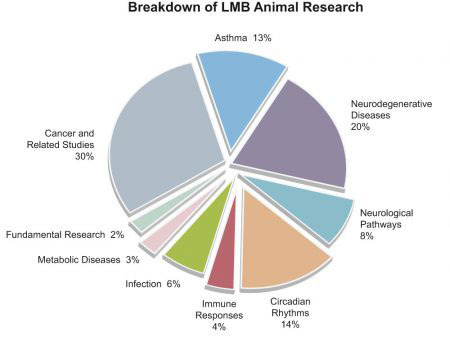 LMB scientists have developed sophisticated transgenic mouse models to understand these diseases and assess new therapeutic strategies. Some people have a genetic predisposition to developing a disease. LMB scientists are investigating the effects of genome instability and cell signalling in the development of cancer. Conducting breeding experiments with transgenic mice carrying specific genetic modifications allows scientists to study these inherited diseases with the aim of identifying new pathways for cancer treatment.